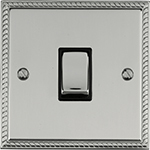 Georgian Elite Flat Plate is an elegant range of electrical accessories of unique design, blending contemporary and traditional styling the square profile flate plate features a finely detailed rope edge. 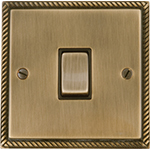 Offering the same minimal projection as plain flat plate designs, Georgian Elite provides an attractive alternative for more traditional interior design schemes. Competitively priced Georgian Elite is available in a choice of Polished Brass or Polished Chrome finishes with White or Black trim, Polished metal rockers provided as standard lend a touch of sheer elegance to this attractive range. 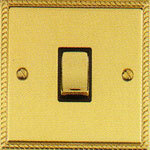 Georgian Elite offers a wide product profile complying fully with the relevant standards.